We made these clear DIY tambourines as a baby sensory toy that was a big hit with all of the kids. The clear plastic plates made sensory play fun with a visual and auditory aspect. 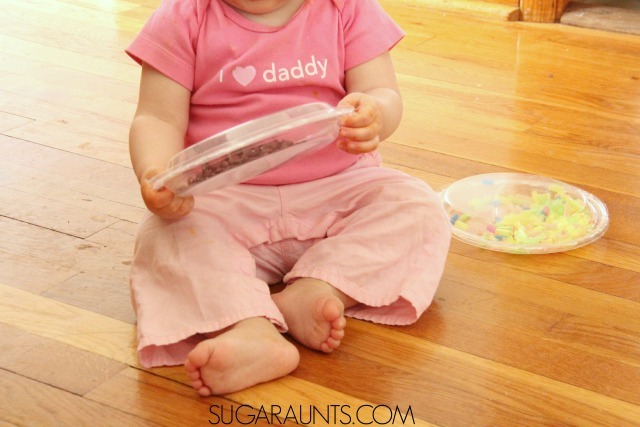 Babies love to play with shaker toys and this DIY tambourine was loved by my 11 month old! Using recycled materials in craft and play is one of our favorite ways to create! This is an easy DIY project that kids of all ages will love. Use recycled clear plastic plates, a hot glue gun, and filler. We used red beans and cut straws to fill our tambourines. I wanted bright and bold colors for our clear tambourines. 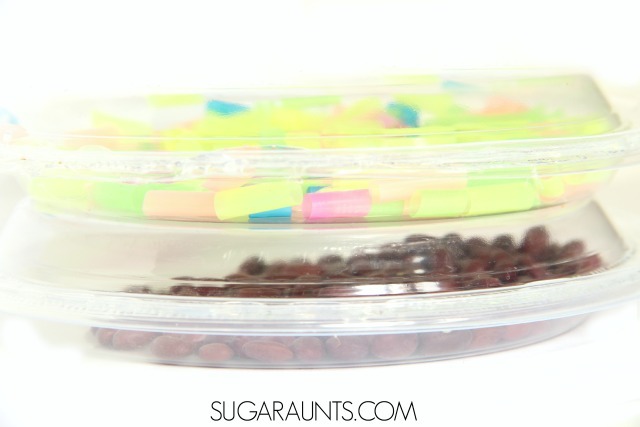 Other fillers might include: dried split peas, chick peas, black beans, or beads. Fill one of the plates with the beans. Little Sister loved helping with this part. She helped me by cutting colorful straws into small pieces. She loved watching the bits of straws shoot across the table as she snipped each one. What a great scissor activity for preschoolers! These brightly colored straws make great tambourine filler. Firmly press the whole outside edges together until the glue hardens. Baby loves these clear tambourines for shaking sensory play! This post is part of the 60 day junk play challenge on Best Toys 4 Toddlers.